I found it: The pink one doesn't have wings. That is why this tattoo is bad. The pink one can't fly, but somehow it is. so he doesn't have to explain to his kids about where pegicorns come from. Charlie sprouted wings and now getting his revenge for the candy mountain incident! "AAyyee take this you stupid unicorn now let me see if I can find YOUR kidney!" The pink one smokes (most likely pot, and gets high). there is no failure i'd say. 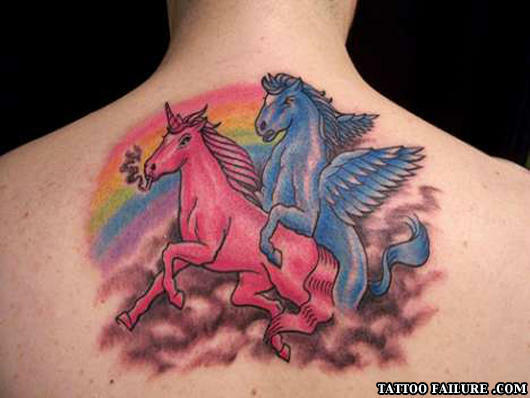 the pink one is a unicorn, the blue one is a Pegasus. This is the most majestic thing I have ever seen. I don't care if it's smoking a cigarette a grown man should never have a pink unicorn tattooed to his body.. The pink one has no wings and there on the clouds. What's going to happen when the blue one pulls out? I fucked a unicorn, and the unicorn won. no one else notice the cigarette? gives a whole new meaning to taste the rainbow. A.Because that's where it wanted to go.